No sooner did San Francisco's hotels settle their two-year-old union dispute than a new group of picketers readied themselves for battle in the foodie court at Westfield's Emporium redevelopment. When the new wing of San Francisco Centre opens later this week, it remains a distinct possibility that members of a union affiliated with the hotel union will be on hand to picket the centrepiece (cough) attraction, the 30,000-square-foot gourmet grocer Bristol Farms, a kind of Southern California version of Draeger's Markets. 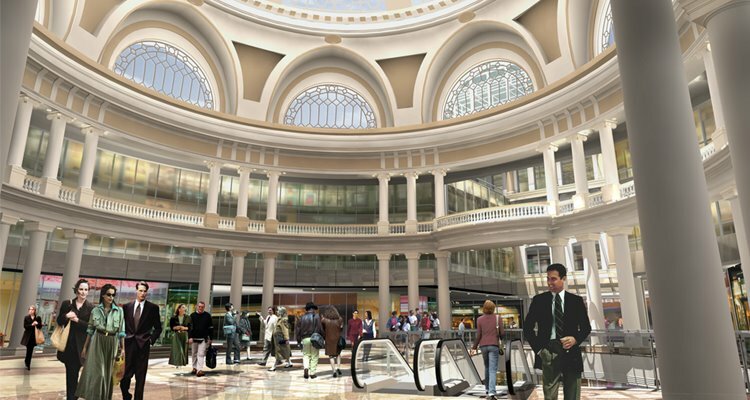 As a redevelopment project, the mall has pledged to allow union organizing. What that means, exactly, is unclear. What is known is that Bristol Farms is a non-union shop in the crosshairs of the United Food and Commercial Workers Union. Linkage: Matier and Ross reported the story Sept. 20, CBS5 picked up the item, and Sunday SFist mentioned the dispute in its Emporium roundup. Bristol Farms (at least the ones South) isn't terribly exciting. Compared with the quality of groceries you can get in West LA, it's decent (more like Andronico's) but nowhere near Draeger's league. The new one won't even be selling booze! The only (dubious) cachet the SoCal stores have is that celebrities shop there, but you can also find them at Gelson's or Whole Foods. That's interesting -- I've never been to Bristol so it's interesting to see how it operates. Given the comparison to Andronico's, I am guess the prices are sky high? I wonder why Draeger's didn't end up in there. Maybe the rent is too hight, or Westfield has a track record with these other guys. Whole Foods probably wasn't a possibility since there is one a few blocks away between Mission and Howard.